Release Date: January 27, 2014. 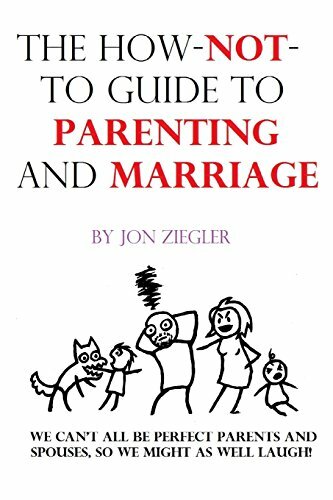 The How-Not-To Guide To Parenting and Marriage is a collection of offbeat, humorous, short stories written by a well-intentioned but definitely far from perfect father and husband. Although the book has elements that nearly all parents and married couples can identify with, the author also delivers a hilariously unique perspective that definitely sets it apart from the usual "funny things my kids said and did" kind of humor. The stories average a short one to three pages in length, making this the perfect book for the coffee break, laundry break, child nap time . . . . . . even bathroom break. Stories from the collection have been featured on The Erma Bombeck Writer's Workshop website, and several popular blogs including Sweatpants and Coffee, Mamapotamus, Fascinations of a Vanilla Housewife, Mommy's Playbook, We are the Dino Family, and The Brown Girl with Long Hair. So if side-splitting parenting and marriage humor is what you are seeking, dive into The How-Not-To Guide To Parenting and Marriage, and you might just be the next person to say, "I laughed until I had tears running down my cheeks!" Should you have a have a migraine and a sore throat that has left you in your room miserable and bored do not, I repeat, DO NOT pick up this book and begin reading. This book will cause extreme bouts of laughter which will not help your head and sore throat at all (although it will have a positive effect upon your heart). I speak through wisdom gained by experience! Don't do it....I'm serious! Great for all parents who need a light-hearted break! I've never really considered myself a writer. I was always told I was supposed to be an artist. Instead, I began a career as a tree trimmer and a tower climber, and have been doing one or the other for the last twenty years. But over those twenty years, I noticed that I had developed a knack at making people laugh with my ridiculous imagination.